I was asked recently if all ladybug baby bedding has a black and red color scheme. The answer to that question is that ladybug bedding and baby stuff has come a long way from that limited color combination. We have recently seen the addition of dragonflies and butterflies along with ladybugs decorating crib comforters and quilts. It’s now very easy to find cute ladybug crib bedding sets in all of the bright, cheery colors of the rainbow! You might worry that the other garden variety critters might water down the ladybugs, but it’s my belief that the other bugs will help to make your baby's room more interesting! All of the cute insects and critters will work together to tickle and amuse your baby while decorating her bed in style! You can try your hand at mixing and matching your ladybug prints with other prints like gingham checks and plaids as well as stripes or even polka dots! ARE LADYBUGS ALWAYS RED and BLACK? Hopefully ladybugs in nature will keep their classic red and black outfits. 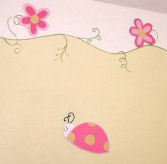 However, we can be creative with their coloring in our ladybug baby bedding and nursery decorating ideas. Even if you give your bug motifs a unique paint job they will still be recognizable as ladybugs. If baby girl bedding or baby girl nursery themes decorated with hot pink ladybugs or insects in turquoise blues and greens tickle your fancy, there are modern fabrics that will fall right in line that will keep baby's nursery theme, ladybug baby bedding and color scheme right on track. There are several collections of floral baby bedding with ladybug motifs that are really cool! 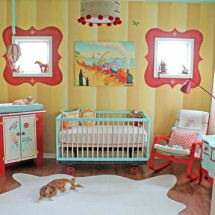 This gives a whole new retro look to ladybug nursery themes and crib decorations! 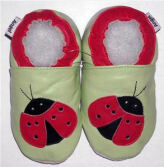 CAN I USE HANDMADE LADYBUG CRIB QUILTS and COMFORTERS RATHER THAN A READY MADE SET? If you are fortunate enough to know how make a hand quilted comforter, by all means go wild and put together your own custom ladybug baby bedding set! A homemade, appliquéd baby quilt is special because you get to choose the pattern, the ladybug fabrics and how to design the stitching on the quilt top. A quick and easy log cabin quilt looks great draped on the side of the crib, on the back of the nursery glider or folded on top of the baby dresser or other ladybug theme nursery furniture. Baby quilts also make excellent ladybug nursery wall decorations! You can hang your ladybug crib quilt on the wall with some quilt hangers in the warm months when baby doesn’t need extra cover. If you have fabric left over, whip up some matching ladybug nursery accessories, throw pillows or a valance to match your quilt. Please make plans to visit our baby website again soon to find more ladybug baby nursery ideas and baby bedding sets for your newborn's first room.